Already some time ago, we have integrated a first video of the series "Operating instructions Germany" in the Android and iOS version of the welcome app. 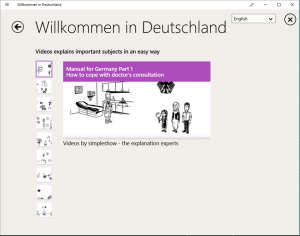 This video shows simpleshow organisation in graphical and linguistic simple way everyday situations that may be challenging for refugees and migrants in Germany with the support of the Lions. In the Windows version, we have included video now above mentioned, as well as more simpleshow videos interesting for the users of our app. The integration into the Android and iOS versions will follow soon. Furthermore, soon new videos from the series "Operating instructions Germany" are published, we will then also engage.